A Dual Moving Magnet, the phono cartridge can be replaced with a removable stylus. Audio Technica has made it easy for you to connect Non-Bluetooth Devices, with the built in phono cartridge, this means that you do not need to have hifi audio pre-built in amps in order to use this device. Since this audio technica has the feature of using AUX Cords, along with this it comes with a 3.5 mm cable convertor giving you the option to connect via RCA or using jack inputs to connect your devices. 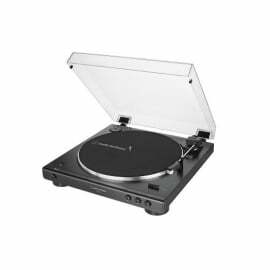 With Audio Technica, they have been highly respected over the vinyl playback community. with adjustments and improvements to the sound quality Audio Technica gives the best in quality when reaching these sounds. The Supplied Cartridge that comes with there devices is a piece of there own and brings a harmony and balance towards the sound that is created. On a boardroom table, the live stage or within a studio, Find yourself a trusted product with Audio Technica, as professionals within the industry like finding a reliable, developed audio product that is flexible towards all kinds of budgets.